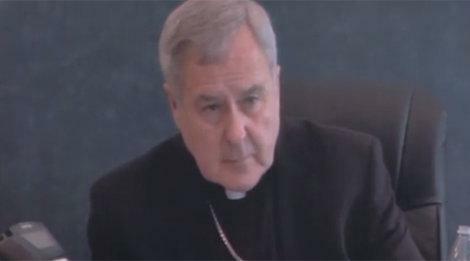 (KMOV) – Secret Archdiocese documents recently released show how the Archbishop of St. Louis Robert Carlson failed to take action on child sexual abuse allegations against former priest Joseph Wajda. The allegations occurred when Carlson was part of the Archdiocese of St. Paul and Minneapolis in the 1970s through the 1990s. According to a news release, Carlson’s actions, along with other officials, allowed Wajda to continue to serve as a priest. Controversy surrounded Carlson following answers he gave during a deposition as part of a sexual abuse lawsuit against the Archdiocese of St. Paul and Minneapolis. Carlson said he “misunderstood” a series of questions when he said he was unsure if he was legally obligated to report sexual abuse to police. Carlson had been deposed for a lawsuit against the Archdiocese of St. Paul and Minneapolis, where he was previously a bishop. Carlson had a role in handling claims against priests who were accused of sexually abusing children from 1979-1994.